This is another of one of those WOW moments in our culinary journey. Most of my professional training/experience came in the arena of French/Bavarian/Western European cuisine. I guess that is why I love sauces so much. Of course, in the early 1970s Texas was not nearly so diverse as it is in 2012. Restaurant choices were limited. Availability of imported foods were limited and seasonal, if you could get them at all. Oddly, it was when I left the culinary arts that i began to experience much more diverse ideas and food. Part of that came from traveling and living in Louisiana. Part of it was the result of the expansion of air cargo and availability of quality imported foods. Part of it was the diversification of the population of Texas. More importantly, because I was no longer “in the business” I was not stuck in a restaurant concept and menu. As such, I began to explore and expand my culinary technique and style to suit my palate and satisfy my curiosity. 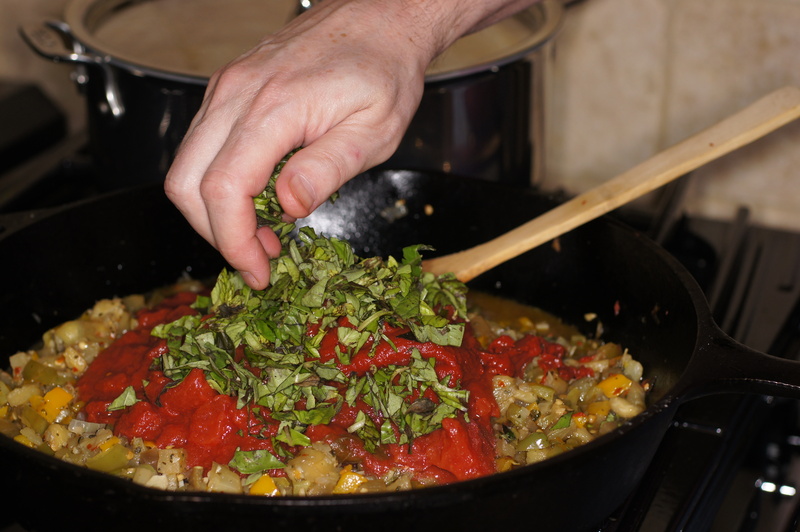 As such my cooking has continually evolved over the last 25+ years and I love trying new and challenging things. The inspiration for this dish comes from Aprons and Sneakers, Baked Anelletti in Aubergine Crust. 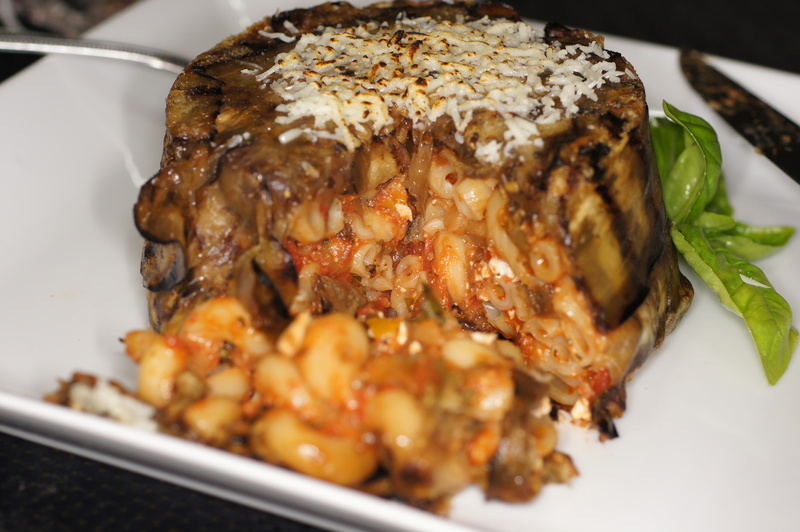 Over the course of time I had seen various baked pasta in crust dishes and was familiar with timbales but never before had I seen such a beautiful dish as the Baked Anelletti in Aubergine Crust. It made me drool and I had to try it. So I did with my own modifications inasmuch as Baby Lady doesn’t eat ground beef or sausage. 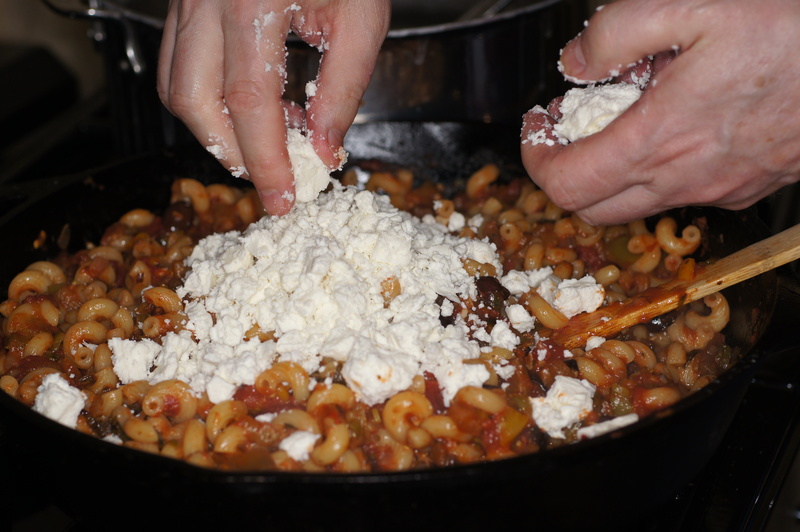 Instead, I modified Campanelle with Eggplant, Olives and Feta Cheese and used it for the sauce for the filling. 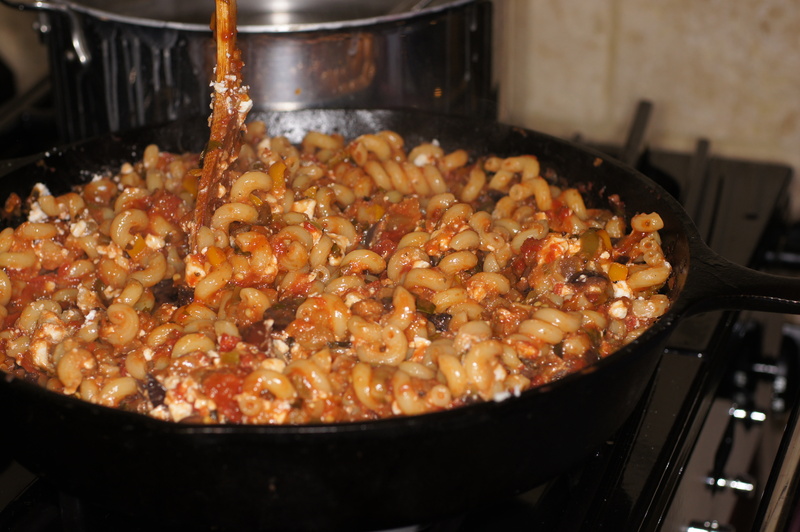 I also used Cavatappi pasta (similar to macaroni). This was the result and it was absolutely delicious. 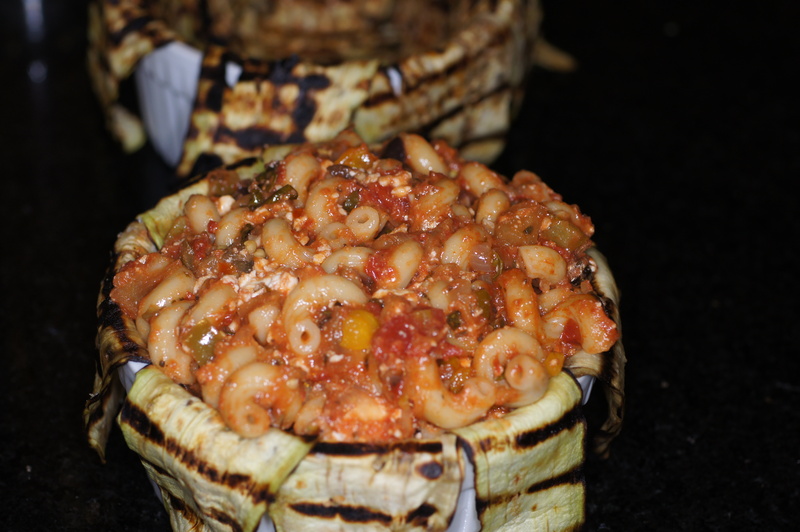 If you get a chance, give this recipe a try. If you want to use a meat sauce instead, go ahead. Make it your way but make it. Thanks to Rowena at Aprons and Sneakers for inspiring me on my culinary journey. This meal is wonderful! Heat 6 tablespoons oil in heavy large pot over medium-high heat. 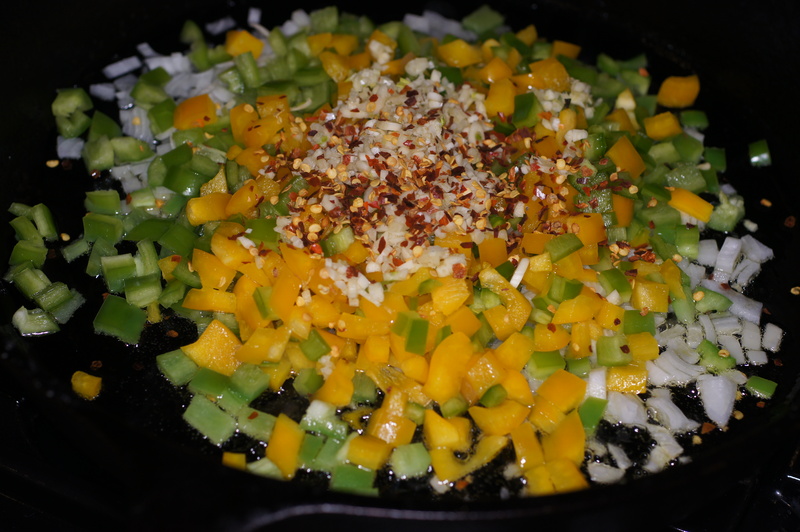 Add onions, bell peppers, garlic and crushed pepper and sauté 3 minutes. Reduce heat to medium-low. Cover; cook until eggplant softens, stirring often, about 15 minutes. Mix in tomatoes with juices, 1 cup basil, olives, tomato paste and vinegar. 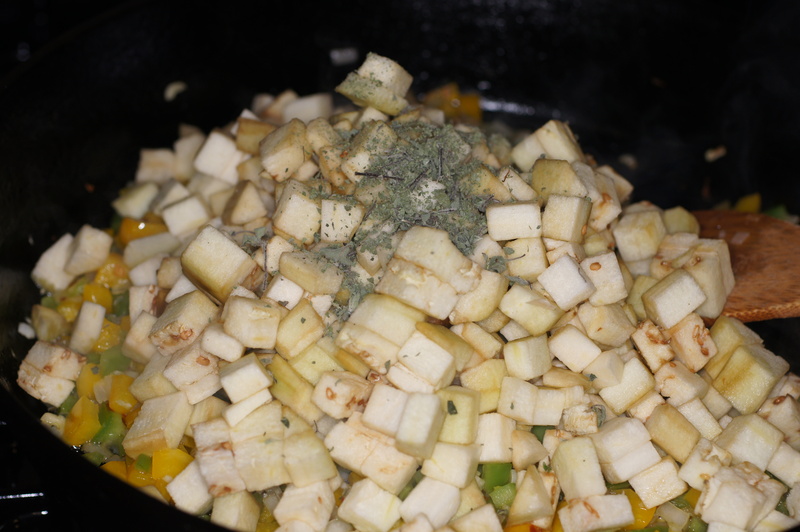 Cover; simmer until all vegetables are tender, stirring occasionally, about 12 minutes. Season with salt and pepper. 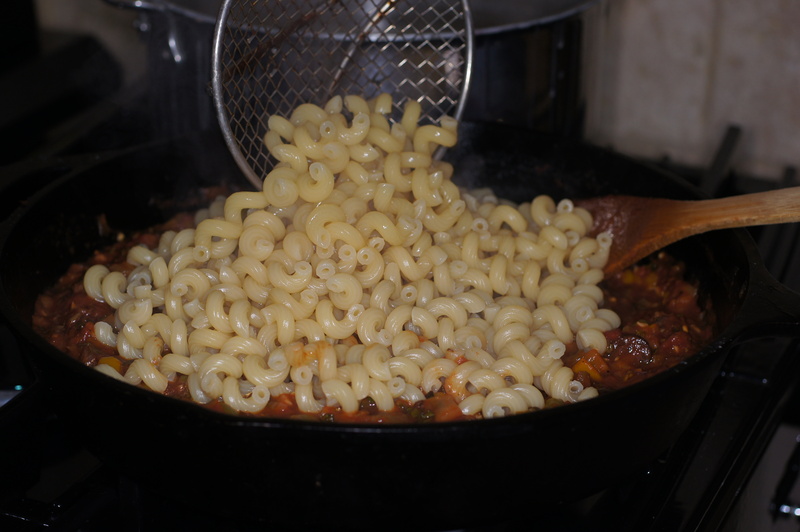 Cook pasta in large pot of boiling salted water until just tender but still firm to bite; drain well. Stir pasta into vegetable mixture. Stir to incorporate and set aside. Peel and slice 2 large Eggplants into 1/4 inch slices. Lightly oil and season with salt. Grill and set aside to cool. 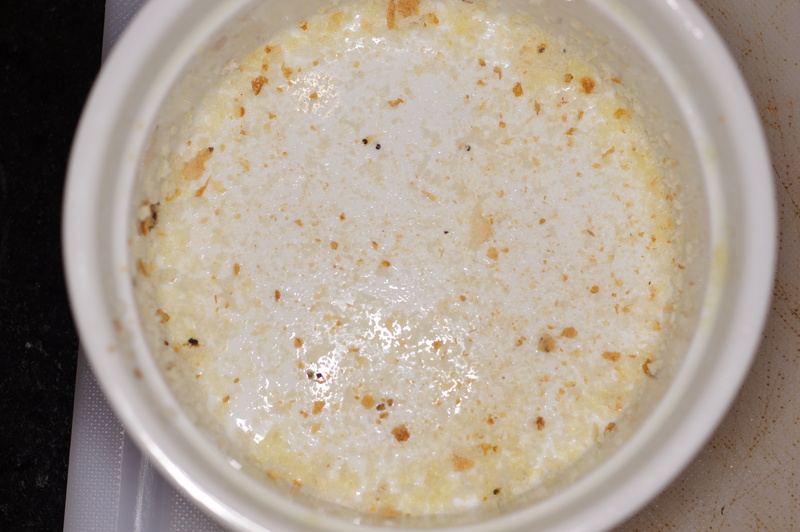 Oil a 5-1/2 inch x 2-1/2 inch baking dish and dust with bread crumbs. 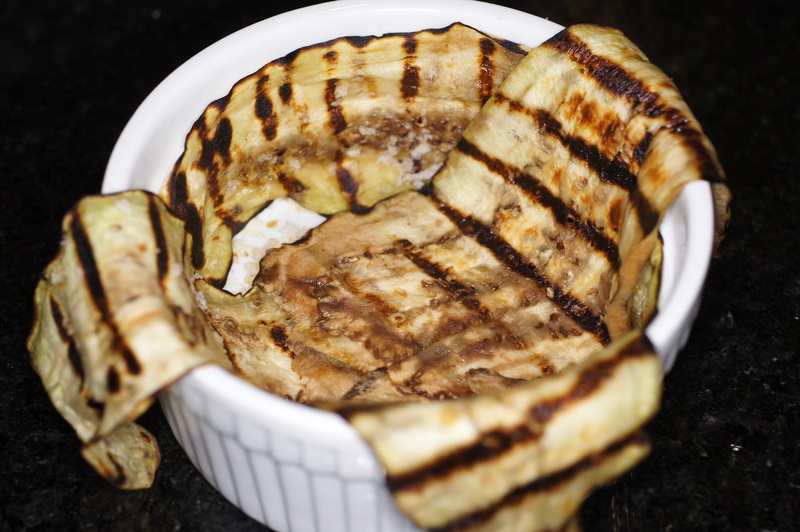 Line the baking dish with the grilled eggplant slices. 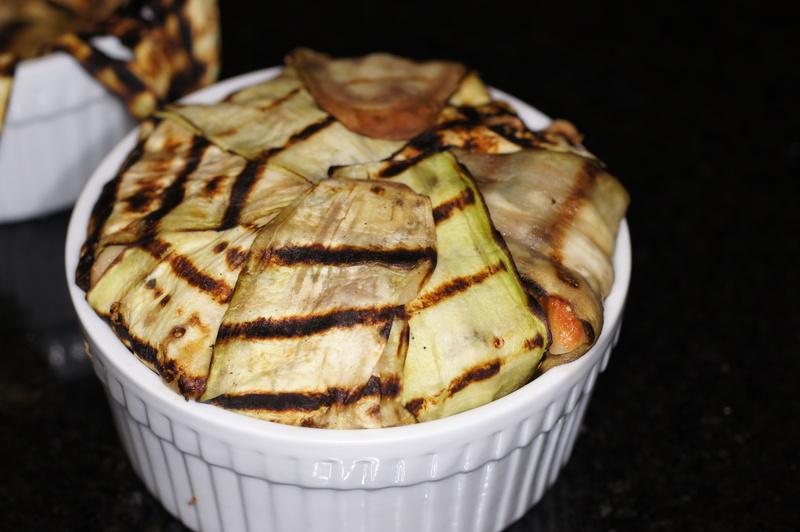 Start by taking eggplant slices and running horizontally (longitudinally) around the perimeter of baking dish. 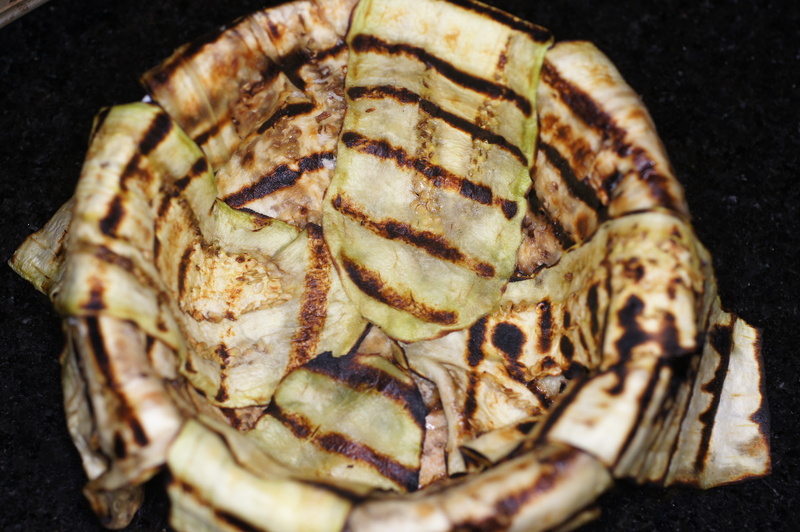 Next, starting at the center of the dish, lay eggplant slices vertically (latitudinally) so that the strips hang over the top edge of the dish. Place baking dish in a 350 F oven and bake for 25 minutes. Remove from oven. Invert in the center of a serving dish. Sprinkle with parmesan cheese and brown. Garnish with basil. Serve and enjoy. Your version looks absolutely divine. I will keep your sauce in mind next time. Thanks for mention! You are more than welcome for the link and mention. You absolutely made my day when I saw your post. I just had to try it. Your photos are so lovely and the recipe is divine. Amazing, as always! Btw, are you still in Texas? Where? My husband and I actually lived in Austin for about 10 years prior to moving to DC. Thanks for your nice comment. Yes, we are still in Texas and will probably stay here forever unless we can find someway to transport our house to Hawaii, foundation and all. We live in Richardson near Firewheel Golf Course. 😀 Yep. It’s low fat, heart healthy and relatively low in calories. Thanks for starting my day off with a good laugh. I will give it a go when I pick up some eggplant. Enjoy the rest of your day! WOW! I’ll have to make this for my mother-in-law when she visits! Thanks for dropping by an your kind comment. I hope you do make it. 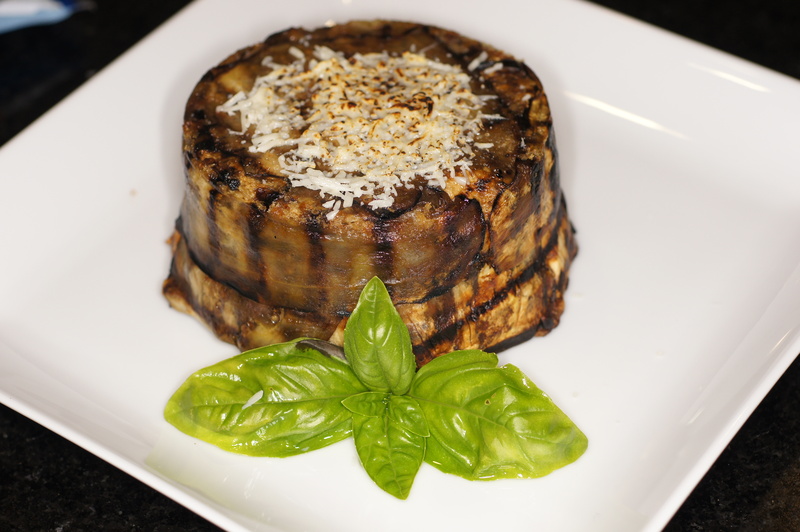 It is much easier than it looks, the flavor is divine and it makes such a beautiful presentation with everyone getting their own little eggplant wrapped package. Then to make it even better, it is actually a healthy dish. How can you get better than that? Thanks. It’s not that hard and makes a beautiful presentation. Give it a try.